We have run into a delay to meet up with the van. The ship doesn't arrive until the 29th or 30th of April. Then there is a holiday on Monday, so we can't get the Sprinter until Tuesday morning. 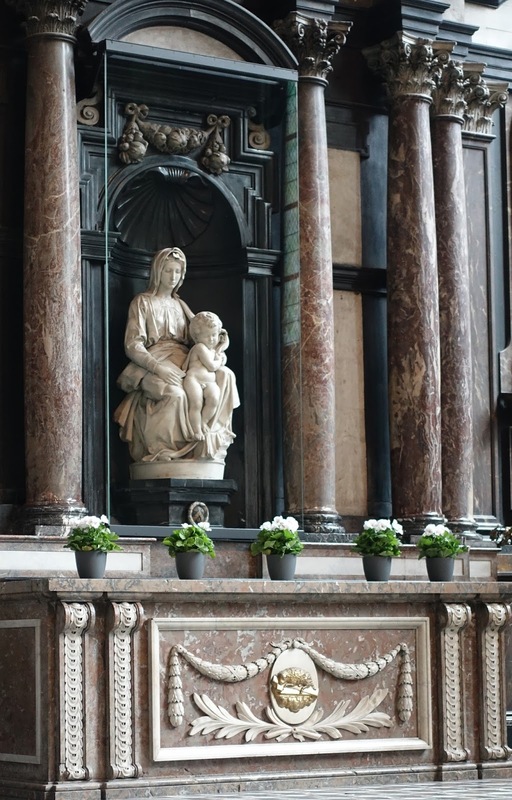 We decided to go to Antwerp to meet with our shipping agent to complete the paperwork to ensure things go smoothly on Tuesday. We have seen everything in Brugge and needed to move on. I love store windows. We walked by this one several times. I love these guys. 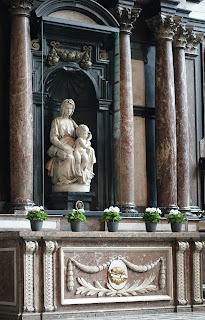 Michelangelo's Madonna of Brugge in the Church of our Lady. It is beautiful but hard to see, to far away and behind a thick piece of glass. Antwerp is a large city compared to Brugge. We have only just arrived, but it looks interesting. We arrived in Central Station which is located in the diamond district. There are jewelry stores in every direction you look. We had dinner at Bier Central in an old beer keg. A restaurant with a lot of character and good food. We will start exploring tomorrow. The forecast is for cold temperatures, thunder storms, rain, and hail. Should be fun. We can hardly wait to get the Sprinter and head south for warmer weather and sun shine.